Baden is a municipality in the Swiss canton of Aargau, on the west bank of the river Limmat, located in the Limmat Valley (German: Limmattal), 25 km (16 mi) northwest of Zurich. It is the seat of the district of Baden. The name refers to the mineral hot springs, which were known at least as far back as the Roman era. Its population in 2010 was over 18,000. The official language of Baden is (the Swiss variety of Standard) German, but the main spoken language is the local variant of the Alemannic Swiss German dialect. Baden was known to the Romans as Aquae Helveticae. In 1040 the town is first mentioned as Baden. Aquae Helveticae was mentioned by Roman historian Tacitus. At that time it was a Roman Vicus to the north of the Baden gorge on the Haselfeld. On the left bank of the Limmat bend there was a pool complex, which was fed by the 47 °C (117 °F) water from a system of springs. The Vicus was founded to support the establishment of the legionary camp at Vindonissa. Both the spa quarter and the residential and commercial district grew to a respectable size in the first half of the first Century AD. The town suffered a setback in 69 AD as members of the XXI Legion burned the wooden buildings of the vicus during the Year of the Four Emperors. The town was rebuilt in stone. When the legion camp at Vindonissa closed in 101 AD, the town shrank again slightly. Although the prosperity of the local spas diminished, the town survived on trade. The pottery workshop of Reginus and the bronze works of Gemellianus flourished in the second half of the 2nd Century. The multiple Alemanni invasions in the different ideas about the middle of the 3rd Century brought an end to settlement at Haselfeld. However, the construction of a fortification to protect the pools, along with a large number of coins from the 4th century which are stamped with references to the hot springs show that the spa area remained settled in late antiquity and was frequented. The main axis of the Vicus was the street which came from Vindonissa. On both sides of this road, which ran parallel to the edge of the steep slope, there were residential and commercial buildings. The road was flanked by porticos, behind which were the retail stores. Behind the commercial buildings were the living quarters, adjoining farms, work spaces and outbuildings. In the center of the settlement were some villa-like buildings. Modernly, the remains of three thermal bathing pools have been discovered. Stein Castle, formerly a stronghold of the Habsburgs, was destroyed in 1415 and again in 1712. 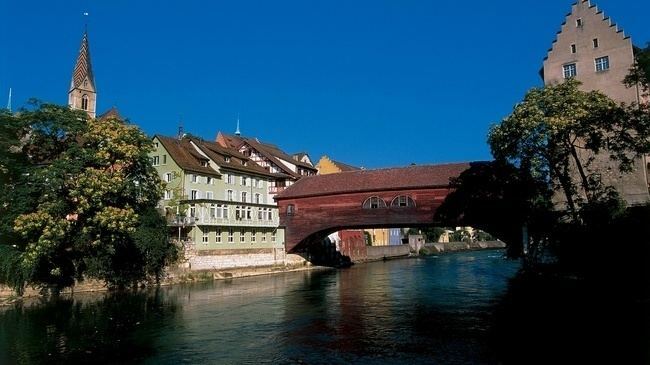 In 1415, Baden (along with Aargau) was conquered by the Eight Swiss Confederates, whose bailiff inhabited the other castle, on the right bank of the Limmat, which defends the ancient bridge across the river. 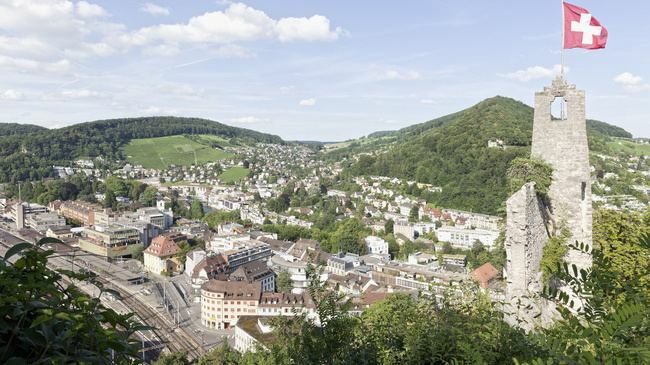 As the conquest of the Aargau was the first made by the Confederates, their delegates (or the federal diet) naturally met at Baden, from 1426 to about 1712, to settle matters relating to these subject lands, so that during that period Baden was effectively the capital of Switzerland. The diet sat in the beautifully carved diet hall in the town-hall or Rathaus, which can be visited. In 1714 the Treaty of Baden was signed, which put to an end to the war between France and the Holy Roman Empire, and thus completed the treaty of Utrecht (1713). 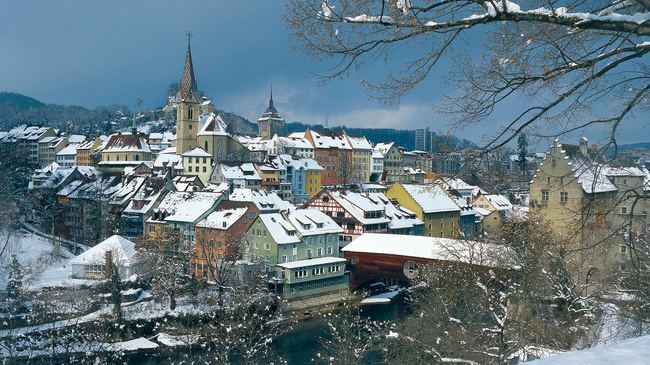 Baden was the capital of the canton of Baden, from 1798 until 1803, when the canton of Aargau was created. Having attained popularity as a Spa and Kur-Ort (Cure resort) during the 15th and 16th centuries, Baden remained popular and was later frequented by an array of prominent people including Johann Wolfgang Goethe, Friedrich Nietzsche, Thomas Mann, and Hermann Hesse, who was to become a particular devotee, visiting the town annually over a period of almost 30 years. Baden has an area, as of 2006, of 13.2 km2 (5.1 sq mi). Of this area, 9.9% is used for agricultural purposes, while 56.9% is forested. Of the rest of the land, 31.6% is settled (buildings or roads) and the remainder (1.6%) is non-productive (rivers or lakes). Baden is the capital of the district of Baden. The original village is located on the left bank of the Limmat river, with the town sections of Kappelerhof, Allmend, Meierhof and Chruzliberg as well as the, independent until 1962, village of Dattwil. On the right bank of the river is the village of Ennetbaden (formerly Kleine Bader). The municipalities of Baden and Neuenhof were considering a merger on 1 January 2012 into a new municipality which would have be known as Baden. This has been refused by a popular vote in Baden on 13 June 2010. As of 2007, Baden had an unemployment rate of 2.54%. As of 2005, there were 64 people employed in the primary economic sector and about 16 businesses involved in this sector. 7,745 people are employed in the secondary sector and there are 178 businesses in this sector. 13,933 people are employed in the tertiary sector, with 1,337 businesses in this sector. Baden is chiefly renowned for its hot sulphur springs, which are mentioned by Tacitus (Histories i. cap. 7), and are considered to be especially beneficial for cases of gout or rheumatic problems. The main Spa lies a little to the north of the old town beside the river Limmat. Many Roman remains have been found in and around the beautiful gardens of the Kursaal. The town, dominated on the west by the ruined castle of Stein, is very picturesque, with steep and narrow streets, a Medieval wooden bridge and one surviving gateway. The old town, the Tagsatzung room in the city hall, the 1847 railway station and the building of the Stiftung Langmatt are listed as heritage sites of national significance. In addition to the Roman city, the ruins of castle Stein and the other sites listed above, Baden is home to a number of other Swiss Heritage Sites. The industrial sites include the ABB Schweiz archive along with the former offices of Brown Boveri Company as well as the regional former utilities plant on Haselstrasse 15. There are three designated religious buildings in Baden; the Catholic city church and Sebastians chapel, the Swiss Reformed parish church and the Synagoge on Parkstrasse 17. Perhaps included in the last two groups is the Crematorium and memorial hall on Zurcherstrasse 108. The wooden bridge between Untere Halde and Wettingerstrasse is also included in the list. A number of individual buildings are also included in the inventory. These include; Bernerhaus at Weite Gasse 13, Haus Zum Schwert on Schwertstrasse or Oelrainstrasse 29, the Hotel Verenahof, the Hotel Zum wilden Mann, the spa-theater with a glass foyer at Parkstrasse 20, the Restaurant Paradies on Cordulaplatz, Villa Boveri (since 1943 Clubhaus BBC/ABB) and the Villa Langmatt (now an art museum) at Romerstrasse 30. The village of Baden is designated as part of the Inventory of Swiss Heritage Sites. Baden is also famous for the traditional delicacy Spanisch Brotli, which is being made once again after a lapse of some years. Due to the physiogeographically situation, the Upper Rhine Plain with Germanys warmest climate, fruitful volcanic soils, already in the Roman period used medicinal springs and spas with very good infrastructural features, the proximity to France and Switzerland Baden had better prerequisites to develop a high quality gastronomy than Wurttemberg or Bavaria. Special plant crops such as tobacco, wine, fruit and horticulture are of supranational importance and offer the inhabitants and visitors a diverse and wide selection of local products. Asparagus and chestnuts are as skilfull used in the kitchen as tripe and escargot and a variety of fruity desserts and pastries is provided for the traditional German "Kaffee und Kuchen" (lit. "coffee and cake", similar to the British tea time). Considering these important gastronomical traditions it may be surprising how small the amount of dishes is that are really speciafically and distinctively from Baden. First of all it does evince great regional differences and many basic recipes and ingredients were adapted and modified from neighbouring countries. This happened with an easiness that is much greater as in other German regional cuisines and as one of the greatest influences came from the French cuisine, the cuisine of Baden is lighter as the cuisines of e.g. Swabia, the Palatinate or Bavaria which feature heartier dishes and have a peasant background. Genuinely from Baden are the high quality and broad selection of local products and pronounced culinary tradition that incorporates and combines many different influences. The Baden cuisine indulges in fruit, herbs and vegetables, game, poultry, fish, smoked products and sausages, wine, Edelbrand, beer and juices from local producers. Spatzle and egg pasta are prepared with more egg than in neighbouring Swabia. The legend tells that the traditional and internationally famous Schwarzwalder Kirschtorte was first prepared in the city of Tubingen (which is in Wurttemberg) but is based on a simple but very tasty dessert from the Black Forest featuring cherries, Kirschwasser and cream. The bohemian, home-cooking Baden cuisine did incorporate many influences from the Alsace and Switzerland. Specialities such as Baeckeoffe and Flammkuchen, Sauerkraut or Schaufele are as famous for Baden as for the Alsace and in both region it is typical to use much flour and fat in the recipes. The unusual combination of sweet and hearty dishes was adapted from Palatine cuisine as was the generous usage of many different wines in a meal. ^ Kristiane Muller (1991). The Rhine. Prentice Hall, APA Publications. p. 109. ISBN 978-0-13-470501-9. Retrieved 21 July 2013.